Because 48 funks just weren’t enough. 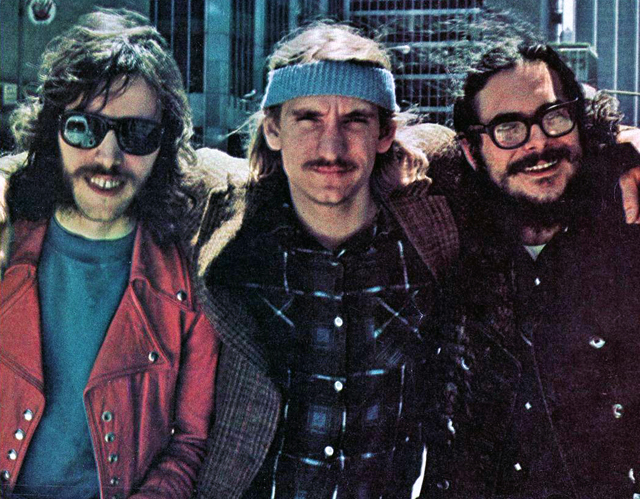 James Gang formed in Ohio in the late 60s and soon leapt to the forefront of American underground rock. The band never hit the Top 40, but became favorites of the newly emerging, free-form FM radio, stations where DJs could play whatever they wished without hewing to a set in stone playlist of only the most popular recordings. Spin a Bach fugue into an obscure Hank Williams tune followed by the entire Side 2 of The Rolling Stones’ “Sticky Fingers”? You bet. Artists driven by singles generally found themselves on AM. Artists driven by albums got played on FM. The song landed on their biggest release, 1970’s James Gang Rides Again. 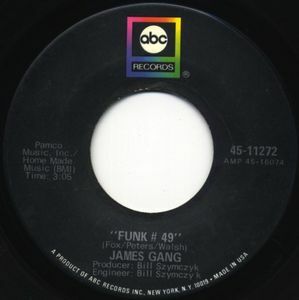 It was too raw and rockin’ for AM, but the FM DJs loved it and turned “Funk #49” into a classic rock staple. The not so secret weapon of the band, the guitarist extraordinaire who also handled the lion’s share of singing and songwriting, was one Joe Walsh. After three albums with the James Gang, he embarked on a solo-ish career before joining a little group called the Eagles. His new band invited him to join after a recommendation from their recently arrived producer, Bill Szymczyk, whom you may remember from about 30 seconds ago. For Joe, fame and fortune ensued. As Chanel had her #5, so did the James Gang have their #49. Let’s riff it up, Midwestern style!